So I love making lists. While it might be attributed to my addiction to office supplies, I think the true reason behind it is because I love the feeling I get when I finally cross something off that list. While I typically have daily to-do lists next to me at work, life to-do lists are truly my favorite. I came across the list that Mark and I made a few weeks ago that outlines things we want to do together. #6. Go on a long drive through the countryside when the leaves are changing. Make a special playlist. #11. Join a wine club. #21. See Alaska and the Northern Lights together. We’ve made our way through a couple of these fun little to-dos, and the list just keeps growing as we learn more about one another. I love that we have this little list as a documentation of where we’ve been and where we’re going. I have a similar “baking” to-do list. I’ve crossed off a number of things including croissants, apple pie (from scratch), and now my very own muffin recipe. As I mentioned when I made these super fantastical scones (truth: you need them in your life), baking my own recipes has been incredibly intimidating. 1/2 of a teaspoon of baking powder could mean the difference between fluffy muffin and a muffin that’s flatter than a dirt road. Baking is such a science, so once I’m able to cross one of my baking to-dos off my list, I’m super jazzed all day long. Guys, I was super jazzed this past Sunday. Gluten Free Vegan Banana Nut Muffins. Aka. my baking pride and joy. See those little brown crunchy bits on the top? That’s brown gold because it’s basically a built-in streusel. 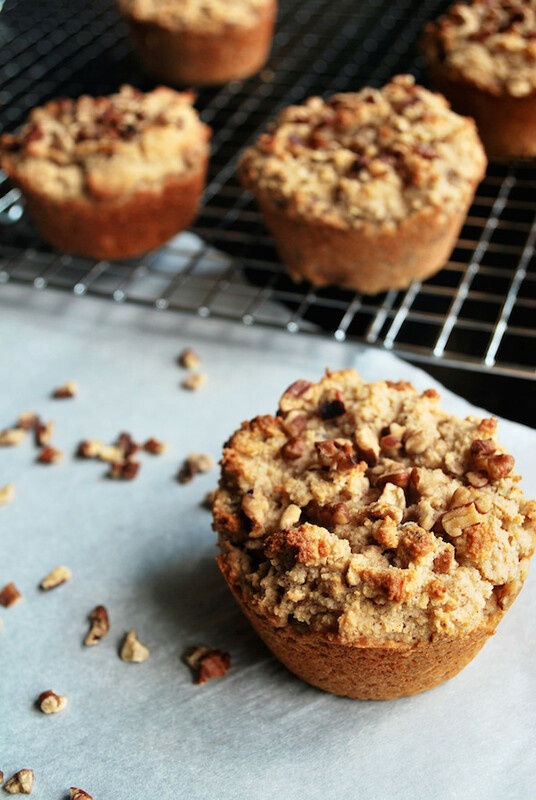 On top of that, these muffins are cinnamony, nutty, tender, and fluffy. Perfect. Guys, these muffins are perfect. Yes, these muffins are super stinkin’ delicious. But you’re going to need to know a bit about the ingredients and baking method before you head off to your kitchen to whip some up and ultimately eat the entire batch. I love bananas because they lend so much sweetness to a baked good without adding a ton of additional sweetener. Because our only additional sweetener is 2 Tbsp. pure maple syrup, you’ll want to make sure that your banana is ripe. Like, on the way to the trash ripe. The riper the banana, the sweeter the muffins. Ya dig? I so dig. We’re also making our own buttermilk for these muffins, which keeps them incredibly tender and (sorry) moist. If you allow a splash of apple cider vinegar mingle with some milk (I used almond), you’ll have freshly curdled buttermilk in just a few minutes! I know vinegar sounds like a crazy addition to a sweet muffin, but pleasepleaseplease don’t leave it out. These muffins are #moistfordays thanks to this nifty kitchen hack. Also: these muffins require three different flours. I know, I know. They’re all temperamental and dramatic. But! Does it help if I say that you can make one of them (oat flour) at home with something that is probably already hiding in your pantry (oats)? And the other two (almond flour and coconut flour) are widely available at most mega-marts? Not convinced? What if I say that you’ll be getting your whole grains, healthy fats, and protein by using these flours over regular all-purpose? I adore using these flours because they all lend unique flavors and textures to baked goods, while ultimately nourishing my body with the things it craves. And I can tell you from experience and from a nearly empty cooling rack: my body craves these muffins. Last thing: you’ll notice you’ll bake these muffins at two different temperatures. My girl Sally is the mastermind behind this clever trick, and I swear to you that there’s no other way to bake a muffin. You’ll bake these muffins at 425 to give them a powerful initial rise. Then, you’ll lower the temperature (without opening the oven door) to continue cooking the muffins through. The result? 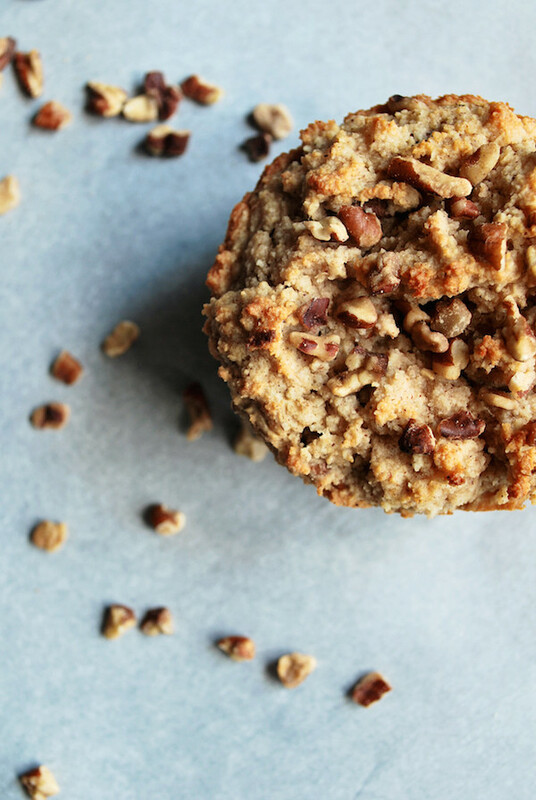 A perfectly fluffy, incredibly tender muffin ready for breakfast, snack time, or dessert. Oh, these muffins. 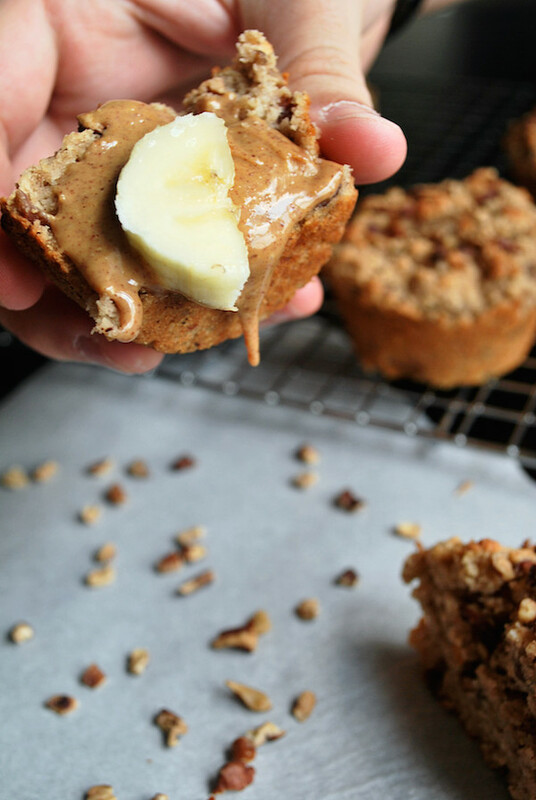 We went bananas over these Banana Nut Muffins. They’re definitely going to be my breakfast this week, and, heck, I may have one now for dessert. Oh, and take it from someone who knows: you must enjoy one of these straight from the oven, slathered in peanut butter. Don’t even question it. Just do it. Preheat the oven to 425 degrees F. Spray/grease a muffin tin and set aside. Add almond flour, oat flour, coconut flour, baking powder, cinnamon, and salt to a large bowl and whisk to combine. Be sure to whisk out any large clumps of flour. Add apple cider vinegar to a 1/2 cup measure. Fill the rest of the measure up with milk. Allow to sit for 5-10 minutes, or until it starts to curdle. This is your homemade buttermilk. Add coconut oil to a small microwave-safe bowl, and melt in the microwave. Add almond butter, banana, vanilla, and maple syrup and mix well to combine. Add “buttermilk,” and mix well to combine. Add liquids to your dry ingredients and mix well until combined. Add nuts, reserving a small portion for topping if desired. The batter will be thick and fluffy. Fill muffin cups all the way to the top. Top with reserved nuts. Bake for 5 minutes at 425 degrees F. WITHOUT OPENING THE OVEN DOOR, lower the oven temperature to 375, and bake for an additional 13 minutes, or until a toothpick inserted into the middle comes out clean. This method gives these muffins optimum rising power. Remove from oven and allow to sit in the muffin tin for 10 minutes. Remove muffins and place on a cooling rack to continue cooling. Enjoy slathered with nut butter, drizzled with maple syrup, or topped with more banana. This recipe was highly adapted from Sally’s Master Muffin Mix. Baked goods are definitely the most intimidating thing to make when developing recipes! Interesting trick about turning down the temperature when baking muffins… never heard of that! Oh you must try this muffin trick, Jessica! It truly does produce the fluffiest muffins! This sounds absolutely perfect! Glad I found your blog! I’m totally with you on the list thing. I constantly have like 6 lists going— for school, for blogging, for grocery shopping, for my schedule. There’s just something so glorious about crossing things off! Love it! Oh, that peanut butter was PERFECT on these muffins! I think I’ll definitely whip up another batch this weekend! Lists are literally my saving-grace. I don’t even know what I’d do without my to-dos!